The U.S. Army provides training for jobs in over 150 career fields—known in the Armed Forces as Military Occupational Specialties (MOS). When enlisting, you will be able to choose one but your options will be limited by the results you get on the Armed Forces Vocational Aptitude Battery (ASVAB). This is a test everyone who decides to join the U.S. military must take. It assesses individuals’ skills and matches them to MOSs in their branch of service. How Does Army Compensation Work? Most Army enlisted active duty soldiers start out with the same basic pay. As of 2019, that was $20,170.80 annually after the first four months of service. Pay during the first four months of basic combat training is slightly lower. After six months of service, pay increases (to $22,608 in 2019) and continues to rise with years of experience. Military pay goes beyond this base salary. It also includes housing for soldiers and dependents, food allowances, and health insurance. While the basic pay may be lower than earnings are for civilian jobs, when everything else is factored in, those who enlist in the Army can end up with higher overall compensation. 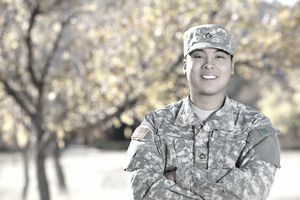 Although basic entry-level earnings are the same for all enlistees, there is extra pay for which some may qualify. Soldiers serving in roles that demand extra responsibility or extraordinary effort may qualify for Special Duty Pay. Others can get Hardship Duty Pay for serving in a location where conditions are poor. There is also Foreign Language Proficiency Pay for soldiers who are proficient in a critical foreign language, Flyer Pay for pilots and non-pilots who work aboard military aircraft, and Diving Duty and Sea Pay. Soldiers in some high demand jobs may qualify for active duty enlistment bonuses. They range from $5,000 to $40,000. While an MOS that offers additional pay may be appealing, don’t forget that the Army will make the ultimate decision about whether to place you in that role. To qualify for one of these MOSs, it must appear in the results of your ASVAB. Talk to an Army recruiter to learn more about high demand jobs and learn how to qualify for them. Job Description: Keeps lines of multi-channel satellite communications running for the entire Army; maintains satellite communication equipment. Civilian Jobs With Matching Duties: Electrical and Electronics Repairer (Commercial and Industrial Equipment); Electronic Home Entertainment Equipment Installer or Repairer; Electronics Engineer; Radio Operator; Telecommunications Equipment Installer or Repairer. Job Description: Identifies foreign communications using signals equipment; analyzes communications; provides translations. Civilian Jobs With Matching Duties: Interpreter or Translator; Computer and Information Systems Manager; Computer Operator; Database Administrator. Job Description: Installs, operates, and maintains microwave communication and technical control equipment. Civilian Jobs With Matching Duties: Electrical and Electronics Repairer (Commercial and Industrial Equipment); Electrical Engineer; Electronics Engineer; First Line Supervisor of Mechanics, Installers, and Repairers. Job Description: Distribute bulk fuels and water from storage facilities to using units; select and submit samples for testing in laboratories; operate distribution equipment. Civilian Jobs With Matching Duties: Hand Packer or Packager; Petroleum Pump System Operator; Refinery Operator, or Gauger; Production Planning and Expediting Clerk; Transportation Manager. Job Description: Moves and places the PATRIOT launching station—a missile system—in various locations; operates the PATRIOT’s components; maintains station; establishes and maintains communications. Civilian Jobs With Matching Duties: Bus and Truck Mechanic or Diesel Engine Specialist; Computer Operator; Electrical or Electronics Repairer (Commercial and Industrial Equipment); Emergency Management Director. Job Description: Operates, places, and maintains complex computer systems and the Sentinal Radar that protects the armed forces from aerial and missile attacks and aerial surveillance; collects and evaluates intelligence data; provides early warnings and conducts engagement operations to destroy threats. Civilian Jobs With Matching Duties: Aerospace Engineering and Operations Technician; Computer and Information Systems Manager; Computer Operator; Electrical or Electronics Repairer (Commercial and Industrial Equipment); Emergency Management Director. Job Description: Uses complicated computer systems to evaluate crucial data about incoming aerial and missile attacks and aerial surveillance; provides early warnings of incoming ballistic missile threats and conducts operations to destroy them. Civilian Jobs With Matching Duties: Computer and Information Systems Manager; Computer Operator; Electrical or Electronics Repairer (Commercial and Industrial Equipment); Emergency Management Director. Job Description: Provides U.S. forces with information about enemies’ strengths, weaknesses, and potential battles areas; debriefs and interrogates sources; prepares reports of findings. Civilian Jobs With Matching Duties: Government Programs Eligibility Interviewer; Interviewer (Admissions Clerk or Registrar); Intelligence Analyst; Special Agent or Police Detective. Job Description: Uses automated data processing equipment to collect, process, and report intelligence; performs initial cryptological digital analysis to establish target identification; develops databases. Civilian Jobs With Matching Duties: Computer and Information Systems Manager; Computer Operator; Databases Administrator; Information Security Analyst; Intelligence Analyst; Management Analyst; Technical Writer. Job Description: Maintains ground surveillance radar and related equipment; inspects and tests equipment; repairs, removes, and replaces defective components and parts; troubleshoots assemblies and elements for deficiencies and malfunctions; prepares and maintains equipment logs and modification records. Civilian Jobs With Matching Duties: Avionics Technician; Computer Operator; Electrical and Electronics Repairer (Commercial and Industrial Equipment), Network and Computer Systems Administrator; Electronics Engineering Technician.